Local business marketing is about connecting with current and prospective customers where they like to frequent, which usually means social media. By participating in existing hashtag conversations, businesses and brands can reach this coveted audience. Social media is as much a part of the holiday season as eggnog and ugly sweater selfies. People want to share the fun things they do and the bargains they find with their circle of friends and family online. This is where holiday hashtags come in. By creating hashtag-specific campaigns, brands can promote their seasonal giveaways, contests, and sales, plus connect with consumers who are specifically looking for their product or service. 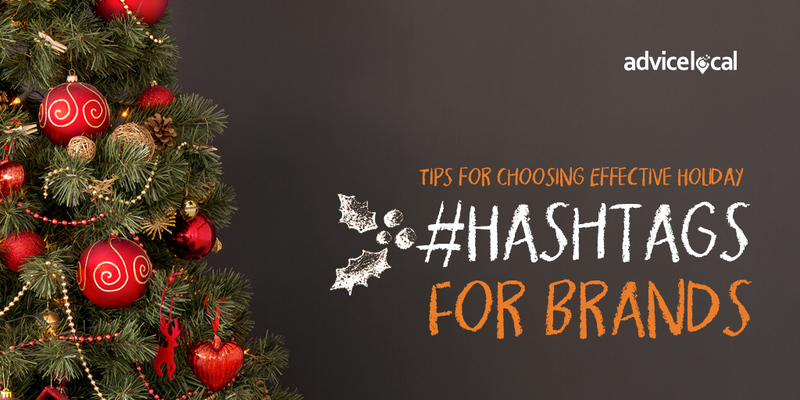 Keep reading for tips on creating and choosing effective, festive holiday hashtags and spread even more joy this season. It may sound counterintuitive at first, but an effective holiday hashtag shouldn’t be all about the brand. In fact, it doesn’t necessarily need to include the business name at all. Instead, shift the focus to the holiday season itself or the upcoming event being promoted by the brand. Hashtags can also be used to highlight the location of a store or restaurant so more local shoppers can discover the business online. The holidays are a time for nostalgia, joy, and giving. Try to come up with a hashtag that not only relates to the brand, sale, or event being promoted, but also ties into the holiday spirit. Depending on the brand’s strategy, the target emotion might be sentimentality, thankfulness, or humor. A good example is Lululemon’s 2014 #givepresence hashtag, which encouraged fans to enjoy every moment of the holiday season while reaffirming the brand’s values; UPS also appealed to emotion with last year’s successful #WishesDelivered campaign. Businesses should avoid using hashtags that are too long or confusing. Your audience is more likely to appreciate a short, snappy hashtag than a paragraph of smushed-together words. A good hashtag feels effortless and fun; it adds context without overcomplicating the post. Keeping your hashtag short and sweet will also help prevent the misunderstandings that sometimes result from wordier hashtags. A hashtag can only be effective if people see it. Take advantage of various social networks to connect with more consumers and give fans a compelling reason to adopt the hashtag. For example, local businesses can hold contests (both online or in-store) and offer a free holiday gift to incentivize participation. Not only does a heavily promoted holiday hashtag create hype among existing fans, but it can also expand the brand’s visibility to a wider audience of potential customers. Once you choose a hashtag to associate with the brand, stick with it! Repetition helps people remember the hashtag and using one main holiday-focused hashtag increases the chance that customers will start to use it as well. It’s crucial to use the exact same phrasing, spelling, and letter case in every instance so the hashtag looks the same to your audience every time. There are lots of great hashtag tools out there for Twitter. One of my favorites is Twubs.com, which makes it easy to embed any hashtag on a website. Simply enter the hashtag you’d like to feature and grab the code to embed it on your website. You can even customize the title color, background color, width, and height of the embed box. Site visitors can then follow the hashtag, tweet right from the website (after authorizing access to their Twitter account), choose to join the thread, and receive updates. 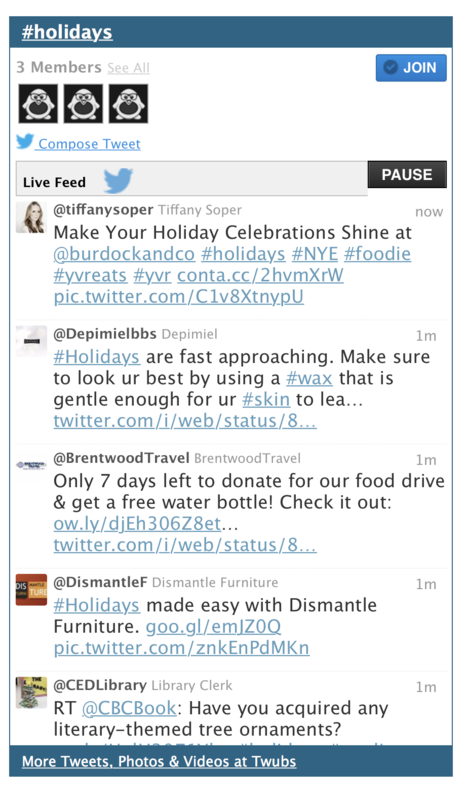 This can also be done through Twitter.com directly by going to settings, selecting widgets, then clicking create new. However, the process isn’t quite as simple as with Twubs, so I’d recommend starting there first. No matter how witty, original, or relevant a hashtag may be, it can only truly be considered effective if it delivers tangible results. Whether the business is aiming to drive online sales or boost Facebook engagement, it’s important to define a goal for the campaign and choose the metrics you want to measure before getting started. Make note of any successes and challenges experienced so the business can apply the lessons learned this season to all future holiday marketing campaigns. Use Hashtags.org to check a hashtag’s popularity on Twitter – but don’t just think Twitter when you think hashtags. As demonstrated above, hashtags are also quite popular on Facebook, Pinterest, Instagram, and even gaining momentum on LinkedIn. When choosing hashtags for other platforms, try tools like Tagboard or Keyhole. This season, take the holiday hashtag to all social channels. The more people that get involved, the more success the hashtag – and the brand – will experience. Do you use hashtags to promote holiday events or specials for a business you represent? Let me know what your favorite holiday hashtags are this season. Be sure to come back each week for more local business tips from the #QueenofLocalSEO.